United Malacca Bhd is a Malaysia based oil palm cultivation company. It is involved in the cultivation of oil palm and crude palm oil milling operations. The group owns two palm mills namely, Bukit Senorang palm mill and Meridian palm oil mill. The business segments of the group are Plantation and Investment Holding. It generates its revenue from the Plantation segment. It’s property estates include Bukit Senorang, South East Pahang, Leong Hin San, Masjid Tanah, Pelin, Malaka Pinda, Machap, Tampin, Selandar, and Batu Anam. The company operates in Malaysia and Indonesia of which key revenue is derived from Malaysia. Thomas Chan Yeu Wai One possible reason is that they are booking paper profits. Their entry is way low than the rm5. This is the same across their portfolio of aeon, shangrila, etc. Will need to see their latest annual report other than Aberdeen who are the fellas trading this counter. Aberdeen is buying now! Wish them that they could buy back all what they had sold at better price! Wish them good luck ! abangadik wow..finally moving up..keep inside safety box for 5-9 years..
abangadik I think Aberdeen shopping today.. they are buying back their favourite : Panamy and Umcca. Skliew Aberdeen stop seling .... means NO MORE SELLERS! Skliew Now Aberdeen and EPF get up from the same side of the bed.. both are buying UMCCA! Hahaha! contribution from the newly acquired Indonesia plantations. abangadik Keep this in your warchest..it will be like KLK...early retirement!!! paperplane Cold eye mentioned before, it is going to boom. It is so true now! supersaiyan3 As more and more plants maturing, total production is actually dropping year after year. This is a wide spread phenomena with all these smaller plantation companies. After 30 years, there will be few plantation companies left. Diamond7 Up and down and up ....so fast!!! Jasper Coo Waiting for dividen soon. This time can cover back some capital loss. Not bad. Next announcement for dividend in December. Fabien Extraordinaire any thoughts on the land sales? commonsense United Malacca (UMCCA) is not the only plantation company that posted disappointing results in the most recent quarters. If you go through other financial reports, most (if not all) plantation companies are affected by the low CPO price in Jul-Sept period. In terms of valuation, all plantation stocks are currently trading at a high PE multiple (for those that still managed to record profit) or in UMCCA case, negative PE. This is reflective of the downturn cycle of the plantation industry. Don't think that the industry will reverse their down cycle anytime soon given the general demand of the commodity is expected to go down in the future. China for example, is negotiating with US to take in more agriculture products from US which would potentially include soybean (or soybean oil). In general, Chinese consumption of oil would not actually go up that much so the increase of soybean oil import from US to China would actually be at the expense of other oil commodities from other countries (in particular palm oil from Indonesia and Malaysia). Another issue is on the European demand of palm oil which is expected to go down exponentially given the proposed ban of palm oil use in food and transportation industries in the future. They have already agreed to phase out the use of palm oil in transport fuel by 2030. Some countries like France and Norway have already started to move away from palm oil. With this in mind you need to have a slightly long-term investment horizon when buying into oil plantation companies like UMCCA as the return to upcycle might not be in the near future. 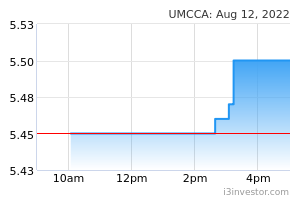 If you are looking to diversify your portfolio outside of United Malacca (due to its earnings uncertainties) I would recommend you to look at MBMR. factorrumour aberdeen run away from umcca because they knew uk and eu is not going to use palm oil anymore? All oils are harmful if cooking goes above a certain temperature no matter it is canola oil, corn oil .... but palm oil can withstand higher temperature. All telecommunication gear could potentially have spy ware issue including those made in USA n western countries .. if not how did the NSA do spying as revealed by Snowden? Fabien Extraordinaire another gruesome results. cefiro22 yet big blocks put up as sellers at 5.40 being gobbled up as soon as keyed in this morning, mine too. Why so eager to buy blocks. Total done at tis time = 693,800 shares...there is an eager buyer to accumulate this stock.